What makes a good DH project? Digital Humanities is an exciting new field that allows people to make really interesting projects in the field of humanities. The possibilities of what you can do are endless, which is why I loved doing several projects and learning a few things about different tools. When you create a project however, I have learned these five important qualities a project should have in order to make it as best as it can be. 1) Your objective should be clear. What is the purpose of this project? Before you even begin, you should be able to answer this question. This is very important because you need to know what you are trying to achieve. For my Google Ngrams project, my objective was to show the usage of “Evolution” and “Charles Darwin” during the Victorian Age, as well as demonstrate the different options that will affect your results when changing some of the options, and case-sensitivity. This was the purpose of this project. 2) Your information should be accurate and relevant. Oops, I just remembered that during my Google Fusion Tables project I got a little off track (but that’s serves as a congratulatory for scrolling through all the photos) for posting a picture of a husky puppy, but the rest of the information is clear and accurate. The information about the vehicles on this long list (wasn’t too tedious) are describing what they are and their performance in terms of sales, which has been sourced from reliable websites to ensure accuracy. That way, it’ll make your project much more informative and it’ll make sense to the average reader who wants to learn a thing or two from it. 3) Design should be just right. This is a little tricky, a boring design will make a project very uninteresting but if you go overboard with the colors and themes, than people will get distracted by the all the “shiny” bits and possibly not take the project seriously. With my word cloud project, the key is to try to aim for that “sweet spot” where your project is just the right design so it can be clearly read and nice to look at. The swan shaped word cloud from my word cloud project is in a cute swan shape and has several nice shades of blue to grab the reader’s attention, but is still in an easy to read font so the words are not hard to read. Did that word cloud hit the sweet spot? I think so. 4) It should be user-friendly. I think this is very important, you really don’t want to frustrate the user don’t you? Good, so don’t be the creator of this site. Anyways back to the word cloud project, there were three sites that we were able to use to make the word clouds. I have used Tagxedo and Wordle. The one I didn’t use was Voyant. 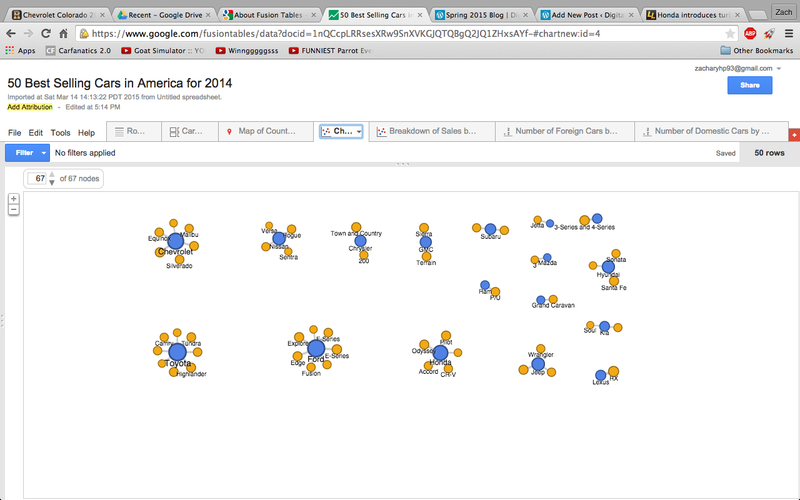 Tagxedo wasn’t the most user friendly but had great options for making word clouds. Wordle was very simple to use but limiting and Voyant was nearly the same as Wordle, but the opposite with most options. Basically, the user should not have to Google how to use ______ to use a project or software, in this day and age, most people should have this figured out. No seriously, I mean it, is it really a bad thing if you don’t have fun while doing a project? Think about it, you’ll learn so much while doing your projects like I have with my Ngrams. When I noticed some trends with my results, I was able to learn a lot about Charles Darwin and Evolution during the time period that I saw an increase in the usage of this word. Plus when Darwin’s Theory of Evolution started to gain traction, I noticed that its usage has increased a lot, and you can also see why this is the case. 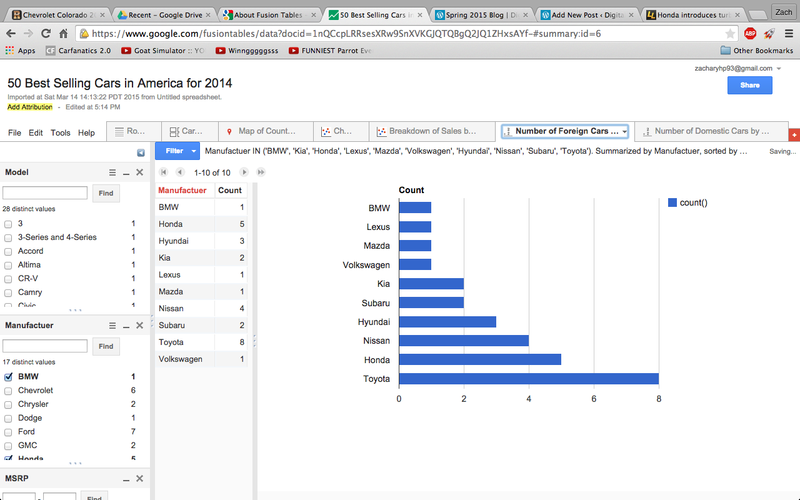 Plus with my Fusion Tables, I loved doing research of the best selling cars of 2014 and seeing what cars Americans want and also learning why this is the case. So how does DH let scholars ask new questions? Many DH projects are shared freely and allow everyone to contribute. People will learn a lot from these projects and they will therefore think and perhaps question what they know. Since people usually collaborate on these projects, they will bring new perspectives to the table and ask questions about things that some people wouldn’t have known if they haven’t seen history or information in that new perspective. 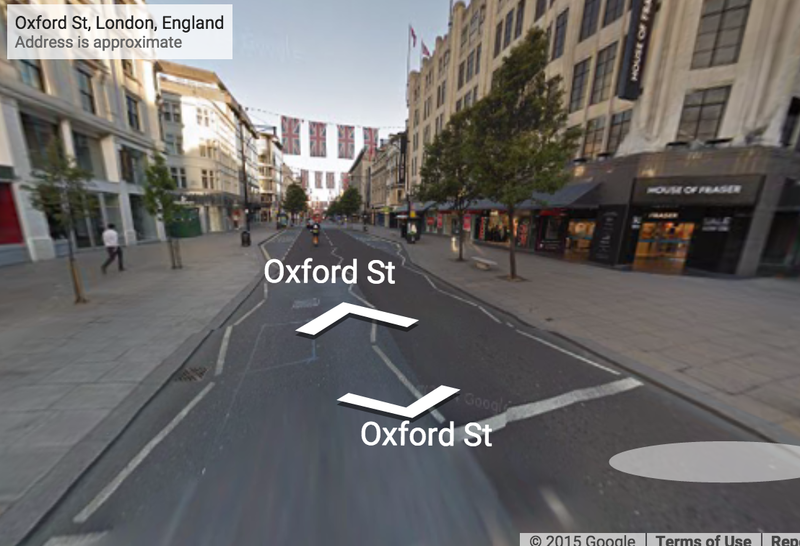 What’s Up with Oxford Street? Oxford Street is quickly mentioned in “The Blue Carbuncle” when Holmes and Watson are rushing to the Alpha Inn in Bloomsbury. At the inn Holmes questions the landlord about where he got his geese from. The landlord then informs them they that the geese were purchased from Mr. Breckenridge in Covent Garden; a market that still exists today. A quick Google search of “Bloomsbury Alpha Inn” revealed that the Alpha Inn was most likely based on a tavern that is still in service today. The Museum Tavern is a small pub that according to Google Maps has “[c]ask ale, global wines and pub grub in a Victorian interior with carved wood and etched glass.” A quick scan of Google Maps showed that Museum Tavern is directly down Oxford Street fitting perfectly with the storyline and the assumption that the Museum Tavern and the Alpha Inn are on in the same. Oxford Street today is a bustling road filled with numerous shops in the city Westminster. It is said to be one of London’s most active and lively shopping streets. This makes a great deal of sense since according to the “Charles Booth Online Archive” Oxford Street passes through almost exclusively middle to upper class living. Oxford Street also passes through Oxford Circus, an intersection between Oxford Street and Regent Street. An interesting observation came about when I was looking at the London town plan map on Google that shows an extensive map of London from the late 19th century. While looking for Oxford Circus I realized it used to be called Regent Circus. A Wikipedia search only provided that it was constructed in the 19th century and a more extensive search didn’t uncover much about why they renamed it. Overall, Oxford Street wasn’t quit of paramount importance to Holmes and Watson. It merely provided a straight stretch to the Alpha Inn. What gas prices? Full-size pickups make up the top three. Then again, a large chunk are used in commercial applications. 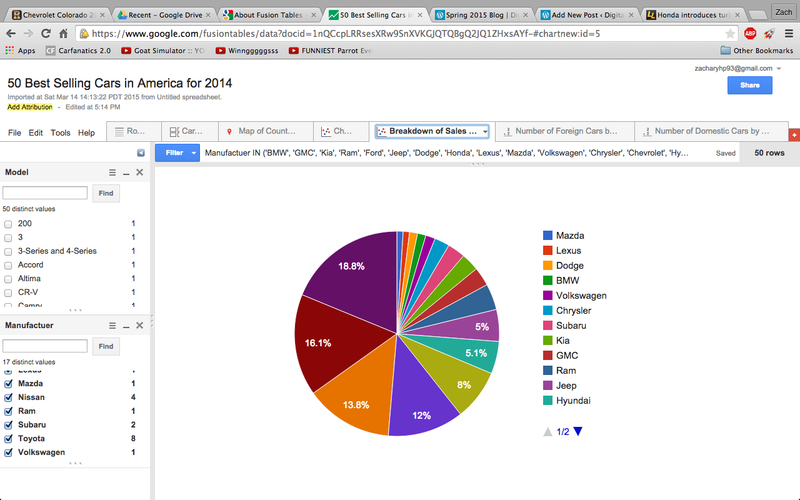 Most cars on this list originate from the United States or Japan. 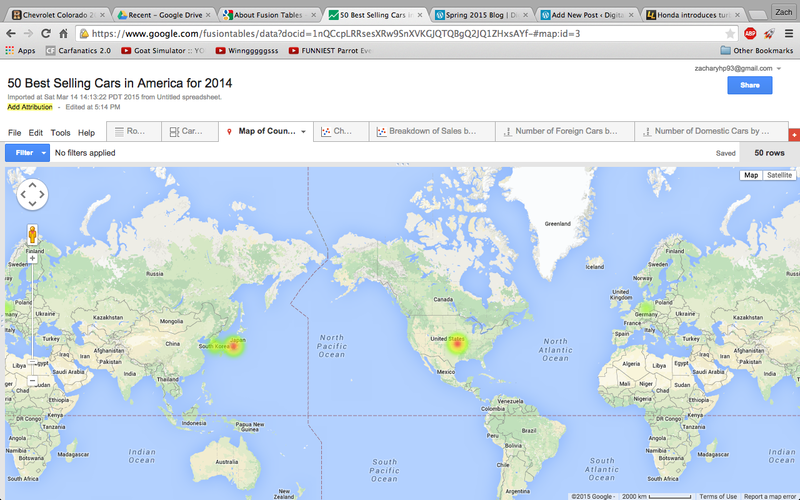 Only a few come from South Korea or Germany. Doesn’t mean there aren’t any red hot Ferraris sold here. A breakdown of sales by brand. 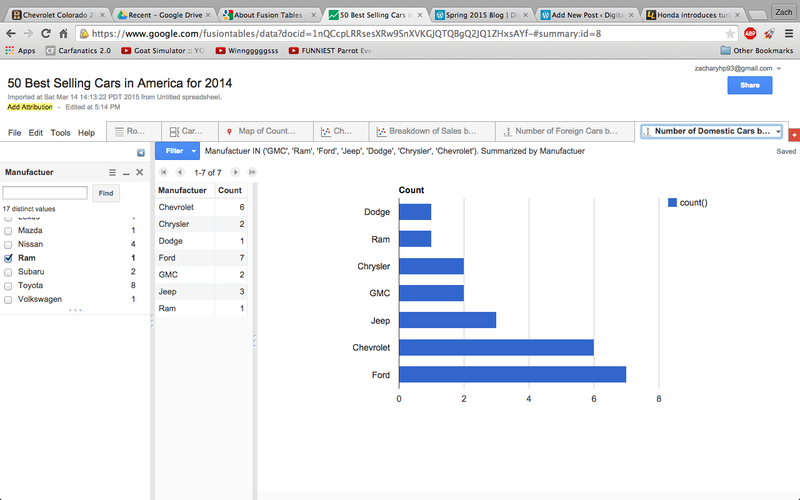 Ford has the most sales on the list. Sorry this post has so many photos, so I’ll make up to you all by posting this adorable husky. 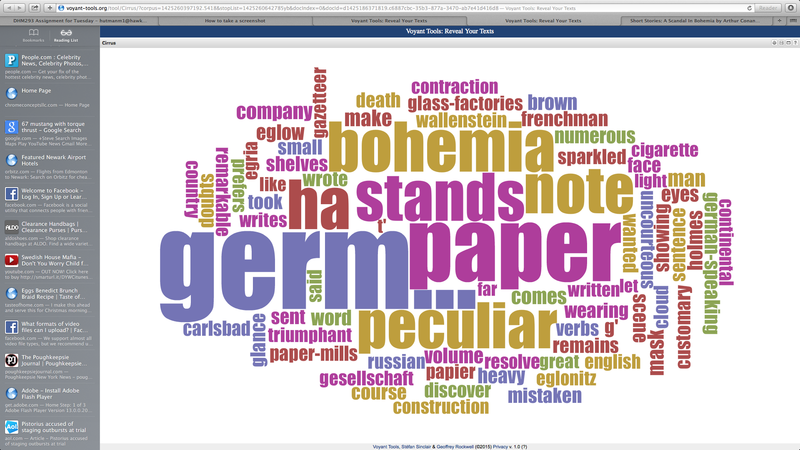 Word clouds or tag clouds are visual depictions of word occurrence that offer greater importance to words that appear more frequently in a piece of text. Moreover, the larger the word is in the cloud, the more common the word was in the source of text. 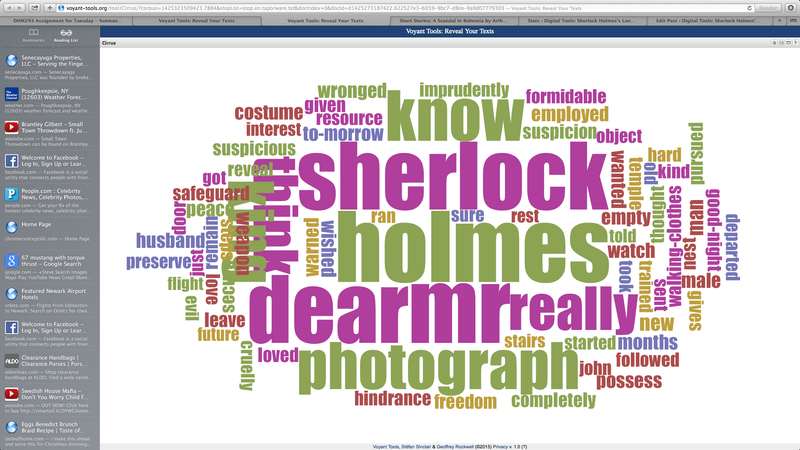 For the word cloud project, I chose the Voyant word cloud generator and the Sherlock Holmes story called A Scandal in Bohemia. In the first word cloud that I have created, it shows what was happening at the beginning of the story when Sherlock Holmes receives a letter in the mail from the King of Bohemia who is asking Sherlock Holmes to do him a favor. During this part of the story, the words that show up the most often is paper, german, bohemia, stands, note, and peculiar. These key words help the reader to understand how the story obtained the title it was given because the word “peculiar” describes something unusual like a scandal is going on and the word “bohemia” describes the location that is involved in the peculiarity. Moreover, based on this particular word cloud, I learned that something peculiar is happening and somehow an individual from Bohemia is involved based on a note that Sherlock Holmes has received. In the second word cloud that I developed, it shows what happened at the end of the story when Sherlock Holmes receives a letter from Irene Adler in regards to the most wanted photograph. During this part of the story, it is evident that some of the words that show up most often are Sherlock Holmes, photograph, know, dear, and really. These fundamental words help the reader understand that Sherlock Holmes did in fact find the photograph but failed to realize how stealthy Irene Adler really is. Even though using word cloud can be an interesting and creative way to portray information, there are also some negative aspects of this tool. According to the Better Evaluation website, one of the pros of this tool is that there are various word and tag cloud generators that are freely available on the internet and creating them is really straightforward. However, based on the Nieman Lab article word clouds can be considered a negative tool because word clouds support only the crudest sorts of textual analysis. In addition, word clouds focus on only the occurrence of specific words instead of concepts and ideas that are important and will help you understand what is going on. Lastly, Word clouds leave the readers to figure out the context of the data by themselves because they have to translate what the jumble of words are trying to depict and explain. The tab I clicked on was the childhood because I was interested in learning the difference between childhood back then and childhood now as children now have many privileges and I wanted to see the comparison. The title that most intrigued me was “How to Amuse the Babies” the way the article itself was titled caught my eye. Seemingly, not much as appeared to change. It it noted that amusing a baby is very important because ” It awakens the intelligence of the child, it exercises its limbs, and all the muscles of those limbs” which is much of the same that we say today. Babies must be engaged because it is key in their development and that is no different. The article also discussed “baby language” and how not a lot is understand about babies which has changed. Though, we can’t decipher was a baby may be trying to say there is more known about babies in general and the way they think and feel things in comparison to adults. I was delighted to see familiar games being talked about like patty cake and the little piggies because I had not known how far back those rhymes dated. It is actually amazing that something as little as that has stood the test of time. The article goes into full detail of how to play patty cake and sing the little pigs which was funny to read written out. 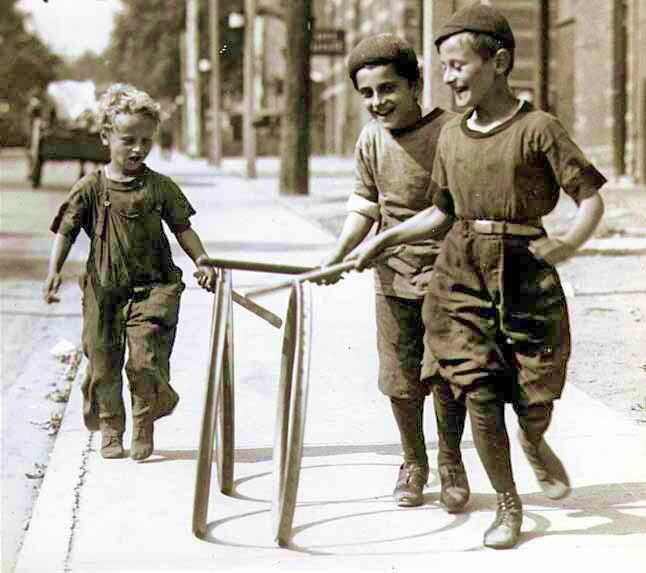 I also read about street children and the games they would play and how their simple games were considered “nuisances.” For example, the hoop game (shown below) would cause adults to call the police if they felt the children were too much in the way.